This blog is coming up on FIVE years (with probably eight years of my reading articles with titles like this one), so I thought I’d give my best shot at a discussion on the keys to finding balance as a working mom. What has been the biggest help to you thus far in your journey as a working mother? What are your top keys for finding balance between work and motherhood? 1. Recognize that you CAN do everything you want — just not everything all at once. When I was younger, I would get angry at statements like these because they implied some weakness… but giving yourself permission to BREATHE — and to honor priorities, whatever they may be — is powerful. It may be a big weight loss project you can’t find the focus for… it may be that book or other self-defining hobby that you can’t do very often anymore. It may be staying in a job that is less than great just because you don’t have the energy for a new job hunt, and at least this job is a known quantity. There’s time for all of it, but maybe not at once. Kids take up a huge amount of your time — raising them, enjoying them, and making their lives run smoothly. 2. Play the “do, delegate, or NOPE” game. Don’t let Pinterest or Facebook tell you what motherhood should look like — not everything NEEDS to be done. We often discuss this with holiday things like Elf on the Shelf — it’s OK to say NOPE! On the other hand, a good manager knows when to delegate, and that is also a core competency of mothers who find balance as working moms. Whether it’s finding a nanny or au pair who can cook and clean as WELL as care for your kids… or outsourcing dinner to frozen meals or another meal delivery service, it’s OK to do things your way. 3. Keep communication open and loving between you and your partner. I’m phrasing it this way because “beat the concept of equal parenting into their head” sounds less good. Very, very, (very) often in parenthood, one person becomes the default parent, and this person has to 1) know everything that is going on in every family member’s life, 2) remember what needs to be done and when, 3) take action on whatever needs to be done (do/delegate/nope), and 4) if the task was delegated to the partner, nag/remember to make sure said task actually got done. THIS STINKS. So, communicate with your partner about everything that needs to be done. The more parts of your lives that can be handed off entirely, so that the other person (or someone else) has to remember/take action/follow through, the better. I’ve found this works better in broad categories than discrete tasks, e.g., don’t split homework help 50/50, because one of you will forget whose turn it is — just make it one parent’s responsibility. By the same token, of everyone in your life right now, from parents to kids to other members of your village, remember that your partner is the one person you chose to be on your team with full knowledge and love for who and what that person was. People change sometimes, but try to remember and appreciate that choice when the stress gets to you. 4. Stay on nodding terms with your past and future selves. There’s an old Joan Didion quote about being well advised to stay on nodding terms with your past self, and I think that’s true in so many regards as a parent. Remember how it felt to be frustrated as a child that you couldn’t do anything, and how optimistic and sure of yourself you were in your 20s as you grew into the woman you were meant to be? I’ve written before about the postpartum identity crisis having a real effect on my happiness, but it’s also true that at a certain point you look up and find yourself surrounded by Legos and feeling frumpy and far from fabulous. Circumstances may prevent you from “becoming your best self” right now, and that’s OK (see above!) but keep an eye on who you WANT to be. What does your future life look like? I think this helps with happiness, which helps with balance, and it also helps with priorities. Those are my top four tips on how to find balance as a working mom — do those resonate with you? 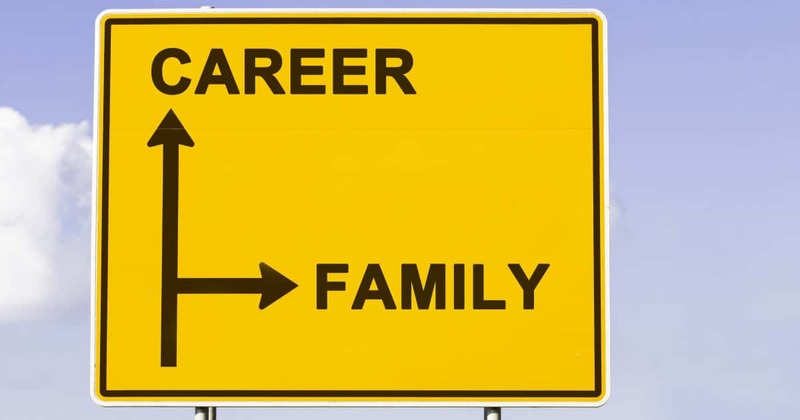 What do YOU think the keys are to finding balance between career, family, and self? Stock photo via Shutterstock / Michael Wick. Pin photo via Deposit Photos / DmitryPoch. My biggest “tip” (if you can even call it that) is to stop at one kid. Everything – from leaning in at work, to traveling, to making time for self-care, to getting enough rest without sacrificing your hobbies – feels so much easier with two adults and just one child. I’ve seen myself and most of my friends go from 0 kids to 1 kid, and then a large number of my friends go from 1 kid to 2 kid, and the balance seems so much harder with 2, especially during the baby/toddler years. I realize there are lots of good reasons to have more than one (and am so glad my friends are having 2+ because I get so many more honorary nieces and nephews to love on) but I do think finding balance is a lot easier with only one. One of the best things I have stumbled into for keeping me sane as a working mother is a hobby that can be squeezed into 10-20 minutes here and there at home. It gives me something that I really love to do, that’s just for me, but I don’t have to stress about blocking off a bunch of time or getting out of the house to do it. And I’m amazed at the progress I have made by seizing these short bursts wherever I can, which kind of feels like a life lesson about how small things add up. Can you share what your hobby is? This is a great tip! I’ve started writing on the side and it’s amazing how much I can do in a short time. I love it. This is a great article Kat, these tips are so relevant. Realising you don’t have time for everything right now is something I have to keep reminding myself. My other tip is to make sure you have some time to yourself. I booked into a sewing class that takes me out of the house to talk to new people and gives me hobby time. I’m exhausted after work and don’t always feel like going but I do, and we’re all happier as a result.